This recipe for Bread Pudding is made simple with your 8 Qt Slow Cooker from Open Country by NESCO. With equal amounts of cream and Nutella® you’ll enjoy a pudding that’s rich and silky with every spoonful. 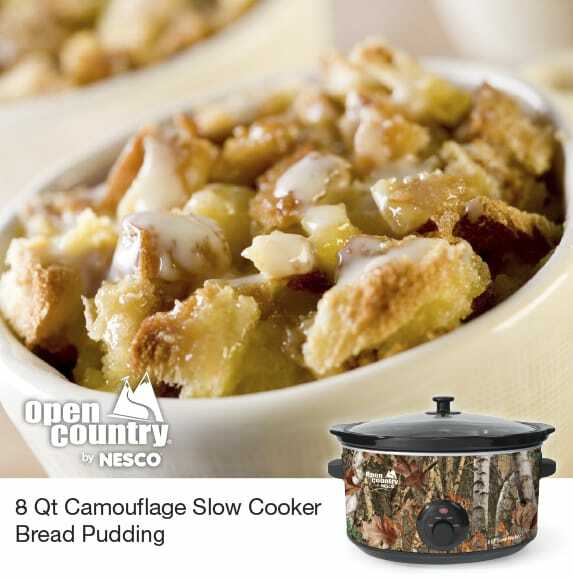 1 cup bread, cubed and dice and place into buttered ceramic cooking pot of your Camouflage Nesco® 8qt Slow Cooker. Whisk until smooth, pour over bread cubes and press cubes until all liquid is absorbed. Cook on LOW setting for 3 hours. Serve warm with vanilla ice cream.